Alvin may have been the more legendary PBA player, but RDO's had a better international career. Last August 18, 2015, we published our picks for the all-time starting five of our national team. We selected Jimmy Alapag, Samboy Lim, Allan Caidic, Caloy Loyzaga and Ranidel de Ocampo. Our last pick turned out to be a little controversial. Those who voted deserve an explanation, so here we're explaining our selection in detail. Once again, each player’s accomplishments in the PBA weren’t considered in making our pick; their contributions as national players were our sole basis. That’s six medals against four in favor of Patrimonio. The four-time PBA MVP’s got his hand on top of this measuring stick. 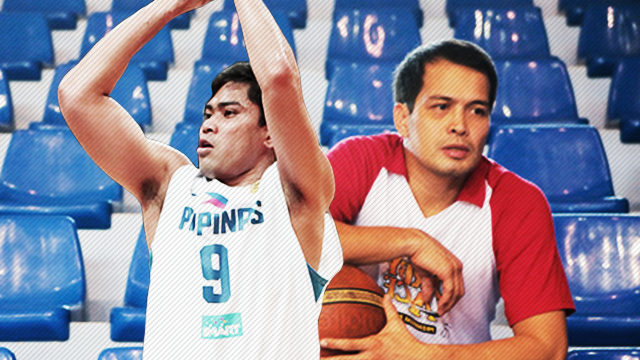 Alvin Patrimonio never played for Team Philippines in an international tourney outside Asia. He was added to 1986 RP team roster bound for the Basketball World Championship, but the 6’3” pivot wasn’t a part of the original squad that did the work to qualify in the tournament. Alvin also never got to play a single game as the '86 national squad was forced to withdraw from competition as the first People Power revolution took place. On the contrary, Ranidel was a cornerstone of the team in 2013 that took the Philippines to its first FIBA Worlds tournament in 36 years. The country’s world-famous run in the 2014 Basketball World Cup was the culmination of RDO’s hard work with Gilas Pilipinas—an achievement that gives him the edge over idol Alvin. Alvin Patrimonio is 0-and-3 against South Korea in big tournaments. In the 1986 Asian Games, 1987 Asian Basketball Confederation Championshp and in 1998 at the 13th Asiad, Patrimonio and his teammates got burned by the hot-shooting Koreans, costing the Philippines a couple of silver medals and a podium finish. On the other end of the floor, RDO—reaching deep into his bag of tricks—helped Gilas pull off the Philippines’ historic win at the 2013 FIBA Asia Championship. In that game, they broke the country’s 28-year dry spell versus their longtime rivals in the silver medal game. Do you still remember how rapturous the whole country was when de Ocampo was successfully busting out tito-like post moves, nailing crucial jumpers and dishing out a couple of crafty assists during that game’s crunch time? You’ve got to give the man his props. In the 1987 Asian Basketball Confederation Championship, now known as the FIBA Asia Championship, Alvin Patrimonio won all-tournament team honors but his squad only ended up in fourth place. Of his multiple appearances as a national player, that was the only time that Captain Lionheart had a remarkable individual tourney. Yet Team Philippines was still ultimately underwhelmed. In his other tour of duties with the RP team, all-time greats Allan Caidic and Samboy Lim were the alpha males—practically turning Patrimonio into an average-looking player. The last time Alvin signed up to represent the country was when he suited up for the 1998 Centennial Team. During that period, he only averaged 5.5 ppg.—a 14-point drop from his PBA output of 19 points per contest. In Ranidel’s case, although, he's never won an individual award as a Philippine team member, his limited but steady production has been essential to the progress of every national contingent he’s been a part of. One good example was when he led Gilas to winning the bronze at the 2014 FIBA Asia Cup while only averaging 12.2 points per gam and 5.2 rebounds per game. It’s the Tanza, Cavite native’s proven mettle during the games’ most tense moments that make his modest international career averages of 9.3 points and 4.3 boards per game resonate a lot more than they appear. We say de Ocampo’s consistency is a far more efficient weapon than Patrimonio’s tremendous talent on the international stage. Alvin’s main strength was his low-post game. In the PBA, when he’s on the low block, backing people up, twisting, turning and pump-faking, the 6’3” Patrimonio was downright unstoppable. But in international tourneys, where the opponents are much larger and stronger, The Captain’s power gets cut down in half or maybe even more. It’s the main reason why the perennial 19- to 25-point PBA scorer is nowhere near as fearsome overseas. Ranidel, on the other hand, is also an undersized PF at 6’6”. But he has those long-range bombs. He can be a dilemma for his bigger but slower defenders because of that. Together with his ability to put the ball on the floor to create plays for others, he's a more versatile weapon. His post moves too—while not as fundamentally sound like Patrimonio's—can be relied upon. At least once a game, usually during crunch time, de Ocampo will free himself up for an easy deuce after executing an unorthodox move—and that's in the midst of a towering defender. Four categories for RDO and one for the Captain. And that’s the ball game. RDO’s skillset simply suits international basketball more than the Captain’s. WE NEED ANSWERS: Is Clarkson Suiting Up For Gilas Or Not?